This season is all about stripes. Inspired by the latest fashion trends we created this case design to help you accessorise your outfit. The clear design allows your phone to be visible underneath the print but unlike a sticker , the cover will protect the whole surface. The Bumper cases are for those of you who want a bit more protection. The Bumper case has two parts: aluminium frame, which you can find in 4 colours- Rose Gold, Gold, Silver and Black and a clear hard plastic back plate. Each case may have slight variations in print as all cases are different sizes and shapes. Our impact cases are beautiful AND strong. This case design must be one of our most favourite. 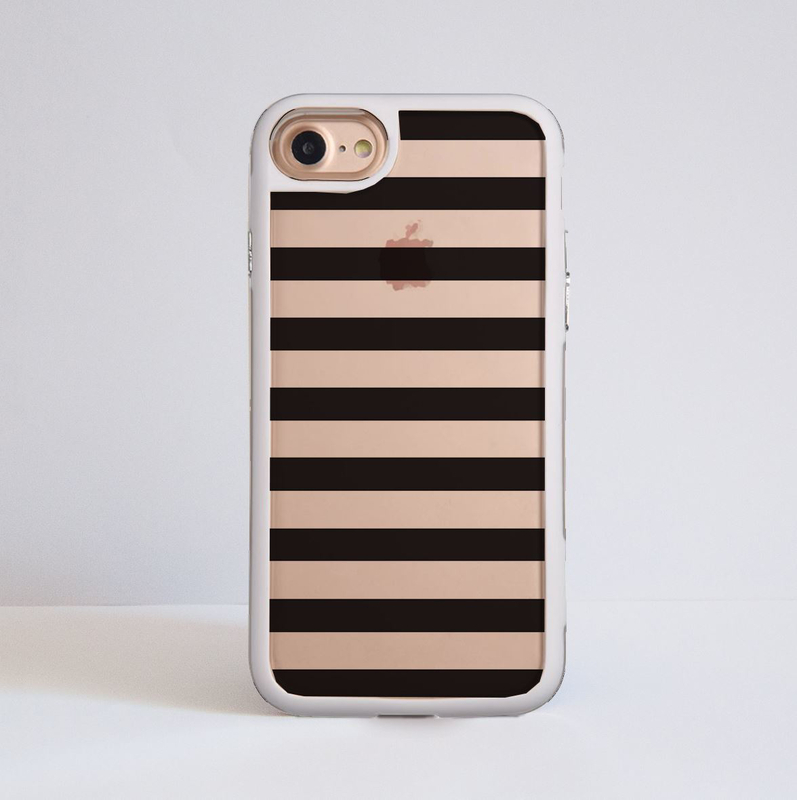 The classic black stripes contrast the metal colour of your luxurious phone underneath and together create a very elegant look for your phone turning it into an accessory, that will match your look. This season is all about stripes. Inspired by the latest fashion trends we have created this minimal case design to accessorise our outfit. The clear design allows your phone to be visible but unlike a decal it will protect the whole surface. 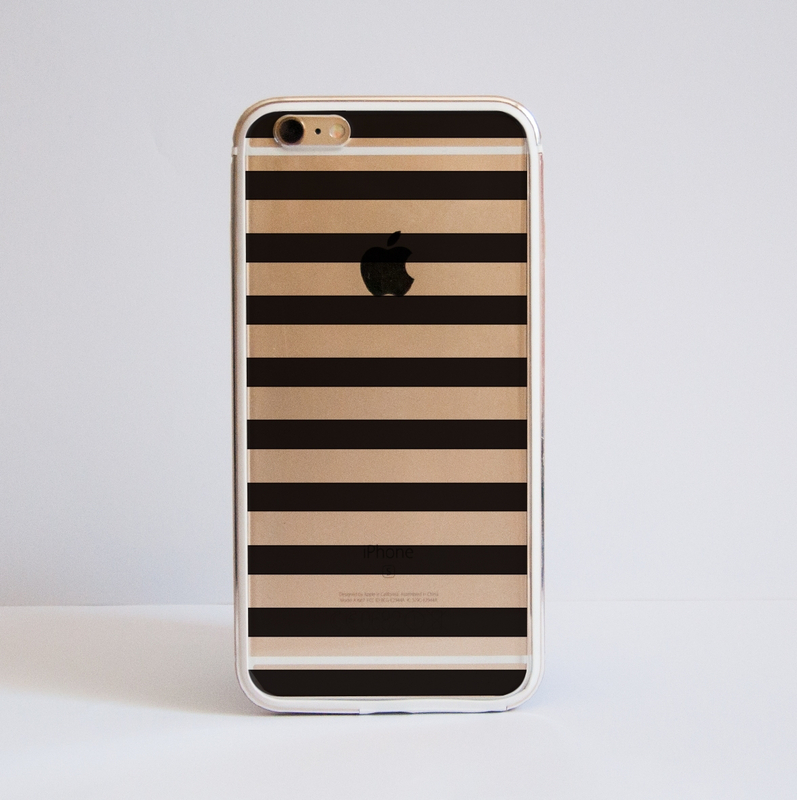 We use our devices all the time, so why not protect them in a stylish way? The pictures above are examples of an iPhone 6 Plus cover. The case itself is made out of crystal clear hard plastic. The final design is printed directly onto the plastic plate with special UV inks, that ensure its durably. Each model has SLIGHT variations of the final print- the design will be more or less zoomed in, as all cases are different sizes and shapes. Also please be aware that different phone models require holes in their cases for camera lens and speakers, which can obscure parts of the design. *They not only offer protection from scratches but add style to your daily outfit too.